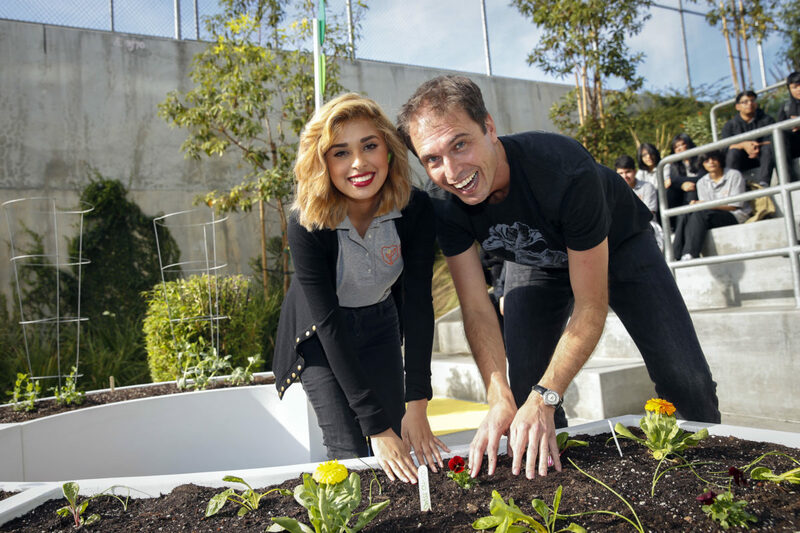 Through his nonprofit, The Kitchen Community, entrepreneur Kimbal Musk is trying to build a better food system for future generations. He's starting with school gardens. Scale is of the utmost importance in the tech world. If your idea is good enough, the theory goes, it should be something just about everyone can use. You can charge each person pennies, but eventually those pennies add up to real dollars. Kimbal Musk, brother of billionaire and business magnate Elon Musk, is applying that principle to the food world. With his sustainable, locally sourced restaurant chain, the Kitchen, and his nonprofit, the Kitchen Community, Musk is making inroads into both local food systems and food education which he hopes can easily be replicated throughout the country and creates a new generation of farmers in the process. Musk grew up in South Africa and spent several years investing in tech companies with his brother. While Elon went on to PayPal, SpaceX, and the Hyperloop project, Kimbal decided to follow a lifetime passion for food and went to cooking school in New York. He was there on September 11, 2001 and spent a week cooking for the first responders, which convinced him that food is the key to community. Musk opened the Kitchen, in Boulder in 2004 with his then-wife Jen Lewin and chef Hugo Matheson. Launched in 2011, the second arm of the nonprofit company, Kitchen Community, focuses on school gardens. Kitchen Community’s Learning Gardens, which are made from are made of 18-inch-tall blocks of white recyclable polyethylene, can be configured in different layouts depending on a school’s needs. They have an integrated drip system which means that maintenance is minimal, especially in the summer and over the weekend. Most importantly, they can be built in just two days. There are currently 268 Learning Gardens in Memphis, Chicago, and Denver, with more on the way, and the Kitchen Community team works with public and private funders to raise the $40,000 necessary to build each one. We talked to the 43-year-old entrepreneur about his multi-pronged approach to fixing the food system and educating the younger generation. You’ve mentioned that scalability is an important aspect of the Learning Gardens. What are some ways you’re working to achieve this? [School gardens] have been done before by some wonderful people, but no one has ever done it in a way that scales. So we’ve basically said: We’re not here to do more school gardens, we’re doing a school garden that can scale. We’ll go into a city from the size of Memphis (around 1 to 1.5 million people) all the way to Chicago (a 15 million person metro area), and we’ll work in a minimum of 100 schools to start. Schools don’t think about a basketball court as a nice thing to have. If you have space, you should have a basketball court. We want the school garden to be like that—part of the school’s fabric. You also hope the school gets integrated into the daily lives of the teacher and students, right? Almost all school gardens are passion projects—someone gets excited about it and does it, then they move on and now … it’s no one’s project. We created an application process that includes [asking] how many people are involved, how many parents are involved, how many teachers are involved, whether the student council is involved, and ask for sign-off from the principal. Then instead of it being a gift to the school, people actually compete for it. I’m constantly surprised by the cool stuff the teachers come up with. One of my favorites is a lesson in the fall. They take the fourth grade class out and split them in two and they have to go harvest whatever looks ripe. Then they sit and they trade. They have to establish value on what their product is depending on what they’re trading with. You’ll see them comparing a zucchini versus a tomato, or a cherry tomato versus the regular tomato. Some fourth graders have never had a whole tomato and they’ll see a big tomato and they’ll try and trade it for four cherry tomatoes, but in the process the teacher gives them a taste of the tomatoes, and when they taste the cherry tomatoes, they won’t trade them for any amount of the big tomatoes. It’s a really fun exercise, and actually a history lesson in how the pioneers survived bartering and trading with the Native Americans. Did working in tech teach you the importance of scale? It taught me the relevance of scale. If you build a company and you reach millions of people and then all of a sudden you build a company and you reach hundreds of people, it’s kind of a weird cognitive disconnect. Obviously it’s wonderful, the stuff that we were doing, but I was like, “Let’s see if we can reach millions of people.” This is not software, so even though we’re at 250 schools, that’s only about 100,000 kids. But that’s 100,000 kids! So, you have to change your mind a bit, but it made me understand the relevance of scale, because if it does scale, it really matters. If it doesn’t scale, it can matter, it can make a real difference. Alice Waters is probably the most famous for inspiring [the idea of a robust school garden program], and there are some writers out there like Michael Pollan who are incredibly impactful. There are different ways to reach people. I actually know how to run an operation that’s fairly big and therefore that’s what I should go do. So why school gardens, out of all the projects you could do to change the food world? The Learning Gardens provide essential education around food. The industrial food system has encouraged less education because the less you know, the more likely you’re going to eat their food. It’s not even food. We need to come up with a term for it. It’s calories, but it’s not food. There’s another very important leg to the stool which is school food. We’re feeding our kids extraordinarily high-calorie, low-nutrient food by design. So our schools are essentially obesity machines. And when I looked at it and tried to tackle it, I couldn’t find a way to scale and have the impact that I could do through the Learning Gardens. Some very interesting players are working in school food. Revolution Foods is working on it and there’s another player who hasn’t announced yet, but we’re going to do everything we can to help him. How do you see the restaurants, which now have locations in Boulder, Denver, Fort Collins, and Chicago (with Memphis coming soon), contributing to the greater food system? The other thing that’s missing in the food system is local supply at scale. So restaurants provide an enormous amount of comfort that existing farmers can have a buyer locally but the reality is that there just aren’t enough [small] farms. If you think about Pittsburgh, Memphis, Chicago, wherever—none of that food that they eat is grown locally. When I say “none,” I mean a negligible percentage. In order for [local farms] to scale to serve a million people in a city, you need a lot of farmers. So how do you solve the problem of creating a new generation of farmers? That is another problem we’re trying to figure out and support other people to do it. How can we get that new generation of farmers interested? You know, with 10 acres of farmland you can generate $100,000 a year and have a very comfortable life that has a lot of meaning and connection to your community and so forth. It’s not that hard to do. It’s just that everyone stares it in the face and says, “This is so out of my depth,” because farming has been removed from our culture for 50 years. It would be like trying to get me to do calculus. I mean, I did it in high school, I know it exists, and it has a purpose, but I couldn’t go back there if I wanted to. But if I saw an economic opportunity, I’d go back and learn calculus without a problem. We need a new generation of farmers to provide food locally that people understand and are connected to. They don’t see it as basically a calorie transport mechanism, but they actually see it as food that can connect them to their community and to each other. Those interested in putting a Learning Garden in their school can apply on the group’s website. Our schools are obesity machines? What decade is Mr. Musk referring to? Certainly not this one. USDA school meals programs are strictly regulated: offer high-calorie, low-nutrient fare, and you fail your audit and lose your federal reimbursement! If this admirable-sounding project is to make headway, the people behind need to educate themselves about what's really happening in the industry they hope to support. They should get to know the Good Food leaders who are transforming K-12 food service in districts large and small, across the nation. Check out https://www.pinterest.com/schoolmealsrock/, for starters. Then visit www.insideschoolfood.com to hear a wealth of stories about creative, progressive solutions that are really working. Congratulations! Your vision has the potential to change our society in so many positive ways. Please add me to your email list. I would like to participate and assist in your efforts.